For those not familiar with the MKS, next to the current (and aging) Lincoln Town Car, the MKS is the premium sedan from the luxury arm of Ford Motor Company and it is also the sibling of the popular new Ford Taurus, sharing many features including the turbocharged EcoBoost V6 engine. In the Taurus, the 3.5L EcoBoost offers 365 horsepower and the same 350lb-ft of torque as the Lincoln but the key feature in the battle against the blizzard of 2011 is the advanced all-wheel-drive system found in both the Taurus SHO and the MKS EcoBoost. The Detroit area did not get the 18” of snow that were expected but with areas reporting as much as a foot on top of the ice and snow already laying around for the last storm, many local businesses and schools closed their doors on Wednesday the 2nd. By the time I took delivery of my 2011 Lincoln MKS EcoBoost, the snow had slowed but the roads were terrible – with some roads covered in inches of snow and slush over ice making driving near impossible. Unfortunately, I had an hour drive north for an important meeting so shortly before rush hour, we set out on our snowy trip in the new Lincoln. Now, one of my daily driven vehicles is an older AWD car so I am no stranger to the advantages of these traction monsters but the all wheel drive system in the MKS EcoBoost made very short work of every road surface that we encountered. In the best places, there were patches of clear asphalt peeking through the ice and snow but for the most part, our drive was made on roads devoid of cars and covered with thick snow. In fine north-of-Detroit fashion, many area roads didn’t appear to have been plowed at all and we passed multiple vehicles that had slid off of the road along with a few that were simply stuck ON the road. At first, I was pretty gentle as I wasn’t sure how the 355 horsepower EcoBoost engine and AWD system in the 2011 MKS would handle the sloppy roads but after a short time, it was clear that it would take far more than a few inches of packed snow and ice to slow down this luxury cruiser. In the rare occasion that the MKS EcoBoost did search for traction, it was always a very short venture as the all-season tires were quick to find solid traction. I’m not talking about a situation where the tires are spinning and the car is making some forward progress – the MKS got traction and drove off like we were driving on dry roads. Around town in stop and go traffic in very poor road conditions, we came across a handful of cars that appear to have simply given up at stoplights where they were unable to get through the snow but even when we hit areas with snow deep enough to pack itself into the lower front fascia, the MKS never hesitated. Once we got onto I-94, we headed into fresh snow and hard-packed snow on the highway – conditions which kept most drivers a long way from the speed limit but once again, the Lincoln made its way along the interstate effortlessly. Not only did the MKS accelerate without any trouble, but not once did we have to worry about the lateral traction of the Lincoln, even at highway speeds. The car was super-stable and provided a very confident drive through the blustery winter weather. My test time in the 2011 Lincoln MKS EcoBoost has just began and while I have my fingers crossed for some nicer days where I can really test the performance measures of the boosted Lincoln sedan, yesterday gave me a remarkable chance to experience the winter capabilities of the MKS EcoBoost AWD and I give the car a very firm A+ in even the worst conditions. 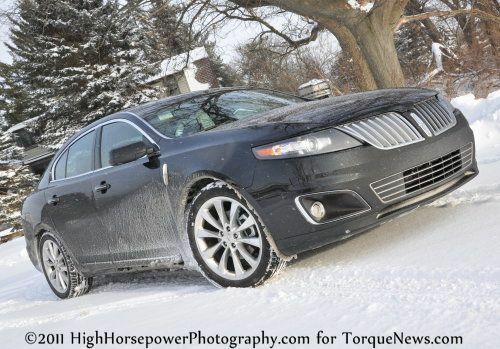 Stay tuned to TorqueNews.com for my full review of the 2011 Lincoln MKS EcoBoost coming soon! Check out the gallery below for a look at the MKS along the route as it effortlessly traversed the snowy roads (and pardon the dirt…it was still snowing).